is a home-based business located north of Cranberry Township, PA. Family-owned and operated, we have 27 years of experience in gas fireplaces, handyman services, renovations, and glass and mirrors. The owner is on every job! 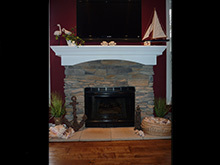 Find out more about our Gas Fireplace installation an maintenance services! Find out more about our Renovations and Handyman services!